In a match that had a crucial momentum swing five minutes before the end of the first half Ayr dominated the whole of the second period of play to finish 3-2 ahead in the try count and overall deserved winners. The turning point also coincided with the Melrose wing Michael Muelace-Julyan being yellow carded for slapping down a pass as he tried to intercept. “When we were down to fourteen men we lost two tries. They scored just before half time and then six minutes into the second half.” observed the Melrose coach, Rob Chrystie, who refused to put defeat down to this point in the game. To lose by just one try was perhaps a compliment to what is a Melrose side missing a large number of top players through injury. “It’s been a long season on the back of two long seasons before. You can see that in the squad. They’re a bit bust,” said Chrystie. The other factor in Ayr gaining the ascendancy was the aerial kicking of stand-off Frazier Climo, whose confidence grew throughout the match. Yet Climo must have had doubts when Melrose took a 12-0 lead on the half-hour mark with a close range try by prop Conor Young converted by Craig Jackson, who then laid on a score for full back Donald Crawford. 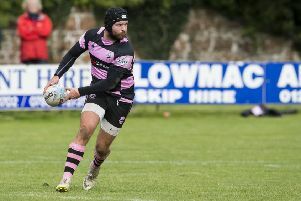 A try and conversion by Climo and then a penalty try on either side of the interval put the Millbrae men ahead and when Glasgow pro Paddy Kelly gave the scoring pass to Kyle Rowe, pictured, Ayr had completed the comeback and booked their place in the Murrayfield final.